A 394-lot, June 11 sale held by Christie’s (25/20/12.5% buyer’s premium) raised a premium-inclusive £6.2m and offered a wide range of riches. Sold at £420,000 was the only example still in private hands of the 13 vellum sets of the great 11-volume Polyglot Bible printed in 1569-72 by Christopher Plantin, expressly for Philip II of Spain. The ‘Audley End Lydgate’, a mid-15th century Middle English manuscript of John Lydgate’s The Fall of Princes, once owned by Mary Sidney, a lady-in-waiting to Elizabeth I, made £320,000. For an illustration, I have opted for Euclid. 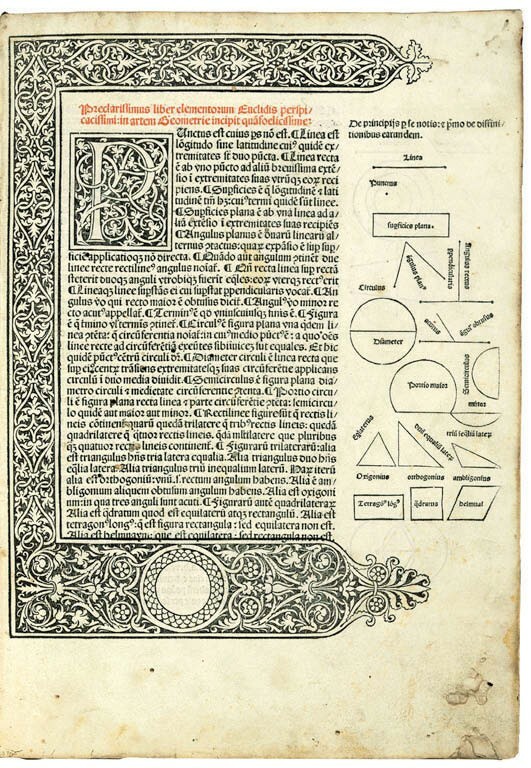 First recorded in the library of the physician and naturalist Johann Kentmann (1518- 74) of Dresden and Torgau, and in a contemporary binding, a tall and fresh copy of the great Elementa geometriae printed by Erhard Ratdoldt of Venice in 1481 sold at £230,000. 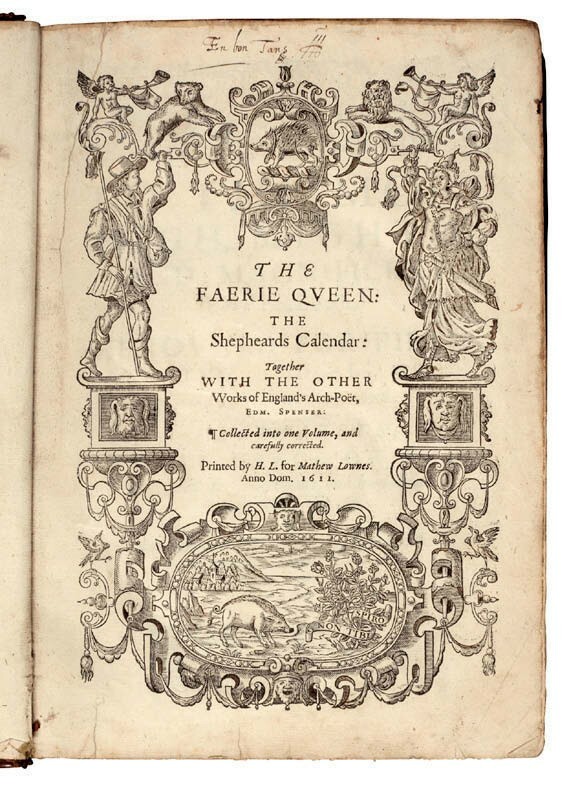 The inscribed title-page of Charles I’s copy of The Faerie Queene, sold at Sotheby’s for £85,000. EH Shepard artworks, initially previewed in ATG No 2346 and featured in a post-sale news story in ATG No 2351, were a highlight of a Sotheby’s (25/20/12.9% buyer’s premium) sale of July 9-10, raising £740,000 between them. Bid to £400,000 in that sale was one of the group of major Darwin lots to which I will return in a future issue – a leaf from his working manuscript for On the Origin of Species… – but illustrated on these pages is a copy of Edmund Spenser’s The Faerie Queene. This is the copy that Charles I read while a prisoner awaiting his execution and in which he has inscribed on a front free endpaper the words “Dum spiro Spero” (While I breathe I hope). It sold at £85,000. 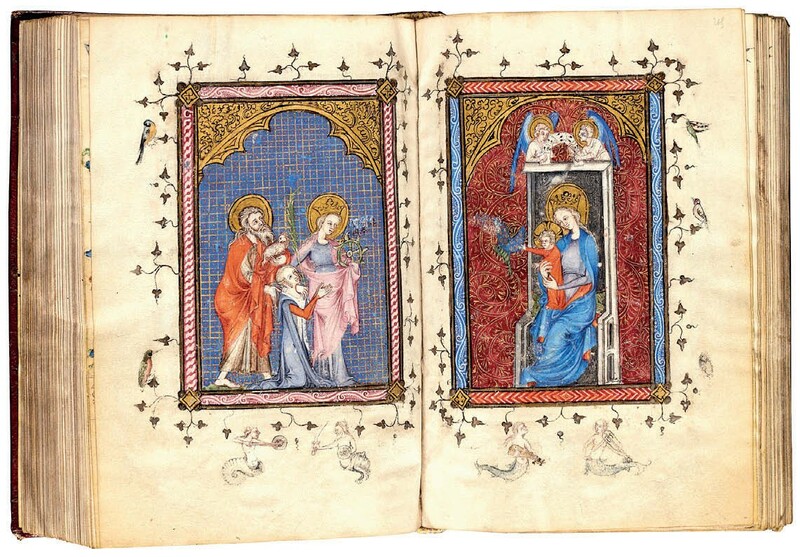 Sotheby’s July 3 sale of medieval and Renaissance manuscripts was led at £500,000 by a richly decorated and illuminated breviary made in Paris around 1360 for Marie, Duchesse de Bar and daughter of Bonne of Luxembourg, and King John II (the Good) of France. The manuscript’s rich decoration and illumination includes six full-page miniatures in three facing pairs by a follower of Jean Pucelle. Two smaller miniatures, 24 historiated initials, occupations of the months, signs of the zodiac and assorted drolleries also feature. Sold for £340,000 by Bloomsbury Auctions (24/20/12% buyer’s premium), a richly illustrated devotional manuscript made for a well-known Renaissance patron of the arts and collector, Isabella d’Este, featured as Pick of the Week, ATG No 2351. A report in ATG No 2348 recorded the sale in Paris of the ‘Peteau Hours’, a late 15th century manuscript illuminated by Jean Poyer of Tours. It was bid to €4.29m (£3.77m) as part of an Agutte dispersal of manuscripts from the seized Aristophil collections. Bearing Dodgson’s critical notes, a page from the withdrawn edition of Through the Looking-Glass sold by Sotheby’s for £30,000. An eighth portion of The Library of a Bibliophile offered by Sotheby’s on July 10 included a Lewis Carroll rarity. 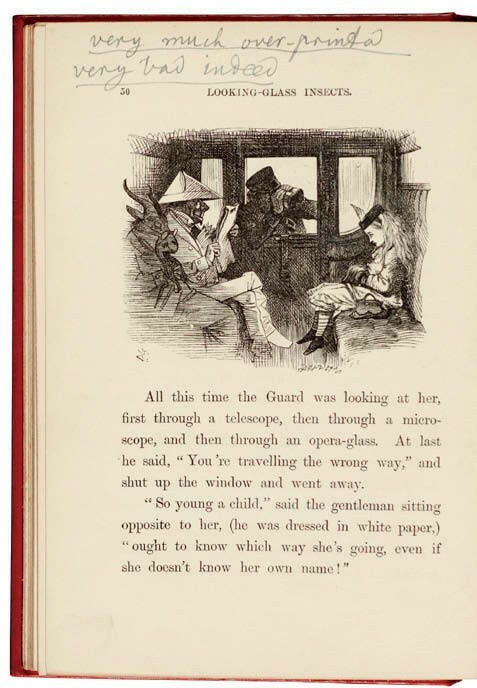 Sold at £30,000, it was the author’s own annotated copy of the 1893, third edition of Through the Looking-Glass, one that he considered so badly printed that he insisted his publishers should withdraw it from circulation. As few as 60 copies of the run of 1000 appear to have been sent out before Macmillan ended distribution. Today, only a handful are recorded in the book’s original red cloth gilt binding. On the page shown above, Dodgson has written “very much over-printed… very bad indeed”. Outside London, one of the more striking summer season results came in a July 20 sale held by Moore Allen & Innocent (20% buyer’s premium) in Cirencester. Sketch of the Analytical Engine invented by Charles Babbage…, a famously rare work in the history of computing, made £95,000. This 1843 offprint from a volume of ‘Scientific Memoirs’ published the previous year is a translation by Lord Byron’s daughter, Augusta Ada King, Countess Lovelace, of a paper written by Luigi Federico Menabrea, an engineer, mathematician, academic and future prime minister of Italy. Ada’s explanatory notes, added at the suggestion of Babbage, whom she assisted in his work on the Difference and Analytical Engines, are about three times the length of the original Menebrea work.